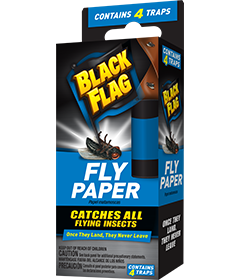 Black Flag® Fly Paper traps houseflies, mosquitoes and other flying insects in the home, porch, patio and garden. This product provides long-lasting protection after opening. 1. If trap is cold, bring to room temperature before using. 2. Slowly pull out ribbon using a twirling motion. Hang away from sunshine. To control gypsy moths: Wrap the tree trunk at a height of approximately 4 ft with Black Flag Fly Paper. As the gypsy moth caterpillar makes its way up the tree to reach the leaves, it must attempt to cross this product. Contact with the sticky surface prevents the insect from crawling further. Disposal: When ribbon is full of insects, remove product, wrap in newspaper and dispose of in trash. Contains natural and synthetic resins in mineral oil on paper. If accidental contact is made with sticky material, surface contacted can be easily cleaned with normal hand cleaner.